The second T20I between India and New Zealand was all about Rohit Sharma. 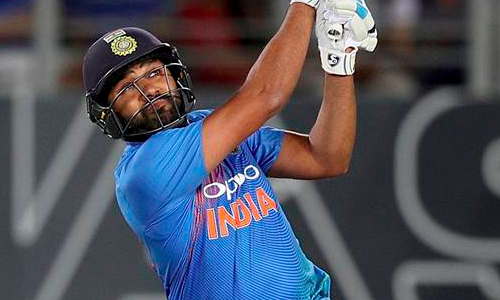 Leading in absence of regular skipper Virat Kohli, Rohit proved his leadership skills are second to none by sticking to the XI that was entirely outplayed in the first match. His decision turned out to be pure gold as the Indian bowlers exhibited commendable skills to restrict the explosive New Zealand batting order to 158-8 after the hosts opted to bat. In reply, Rohit came out all guns blazing as he stitched a 79-run partnership with Shikhar Dhawan. The dashing opener smashed four sixes – a couple of pull shots, a hoick over fine leg and a gigantic smack over long off – en route to becoming the leading run-scorer in the shortest format of the game. After completing his fifty in 29 balls, Rohit was caught by Tim Southee off Ish Sodh. The job was done by then as the visitors went on to chase the target with seven wickets and as many balls to spare. With the series now locked up at 1-1, the two teams will now meet in the all-important clash in Hamilton on Sunday.